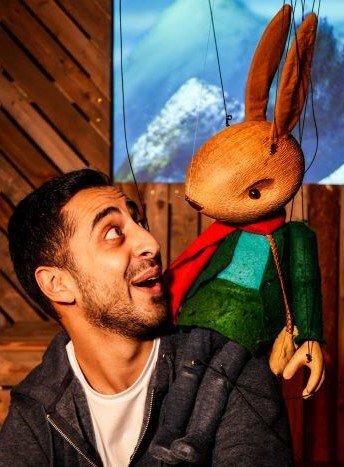 ‘Rabbit Girl and the Search for Wonder’ is a playful, and poignant family show by 154 Collective, inspired by the imagination of 8-year-olds and full of the joy of storytelling, live music and projected animation. Rabbit Girl will be visiting Ormskirk Library at 2pm on Thursday 21 February. Tickets are available directly from the library over the counter or by calling 01254 660360. More information, including booking online is available via www.spotonlancashire.co.uk. There is also a free craft workshop to make your own woodland creature on Monday 18 February at 11am until 4pm – the workshop is a drop in activity throughout the day for all ages. Join Rabbit Girl and her dad as they set off on a camping adventure, telling stories of courage, bravery and daring escapades around their campfire. Watch the story unfold through projection and music, all told by the central character ‘Rabbit Girl’, a wooden marionette puppet controlled using strings. ‘Rabbit Girl and the Search for Wonder’ has been brought to Lancashire by Spot On and forms part of the Spring season of performances.